23/09/16 -- Soycomplex: Beans closed sharply lower to end the week. Continued anecdotal reports of big yields and the outlook for drier weather ahead weighed on the market. "Yield reports though are trumping any weather delays with 60 and 70 bushels yields being bandied about from MO to IA to western MN," said Benson Quinn. Palm oil was lower, and crude sharply weaker. Add in a firmer US dollar and there was little bullish news to end the week. Brazil's Mato Grosso has started soybean planting, so too has Parana where they are 3% done. 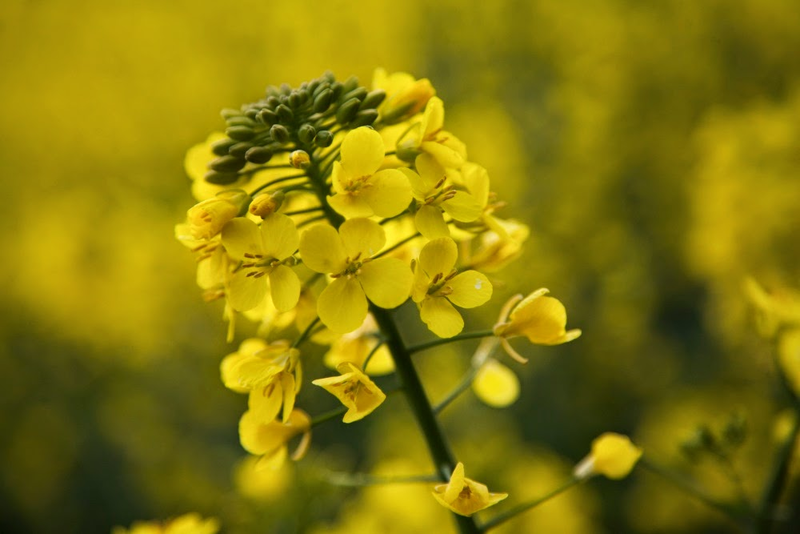 Coceral estimated the EU-28 rapeseed crop at under 20 MMT compared to 22.3 MMT a year ago. The USDA are at 20 MMT, with consumption at almost 24 MMT. The weekly Commitment of Traders Report showed managed money increasing their net long position by 11,444 contracts for the week ending Tuesday night. Nov 16 Soybeans settled at $9.55, down 21 1/2 cents; Jan 17 Soybeans settled at $9.61, down 21 cents; Oct 16 Soybean Meal settled at $303.30, down $4.60; Oct 16 Soybean Oil settled at 33.31, down 65 points. Versus last Friday beans were 11 cents lower, meal was down $10.40 and oil was up 133 points. 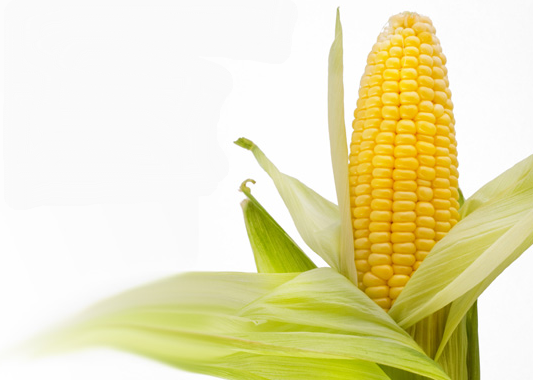 Corn: Corn closed fractionally lower on the day and for the week. Harvest pressure is a negative, with an estimated 20% of the US crop thought likely to have been cut by Sunday night. Still, unlike beans, anecdotal reports from the field on corn are of lower yields than last year. As well as talk of lower yields there's also trade gossip that the wet weather has cause quite a few disease problems this year. That seems to be limiting downside for now. So too does the size of the short held by managed money, placed at -161,592 net contracts as of Tuesday night. One talking point today was the decision by China to place a 33% anti dumping levy on US DDGS imports as they struggle to dispose of their own domestic government-owned corn mountain. Coceral pegged EU-28 corn output 1 MMT down from June, but 3 MMT above last year, at 61 MMT. In Brazil Parana state is said to be 34% planted on corn. The market is drifting along directionless for now. Next Friday, the USDA release their quarterly stocks report that could provide some direction to the market. Dec 16 Corn settled at $3.36 1/2, down 1/4 cent; Mar 17 Corn settled at $3.46 1/4, down 1/2 cent. For the week Dec 16 was 1/2 cent lower and Mar 17 was down a cent. Wheat: Wheat closed little changed on the day but higher for the week. The Indian government lowered its wheat import tax to 10% from 25% as part of an effort to curb food price inflation. Some are forecasting that this could trigger imports of up to 5 MMT this season. The USDA are currently at 2 MMT. Australian and Black Sea wheat are likely to be the main beneficiaries. Ukraine wheat has been scoring on price recently. The Buenos Aires Grain Exchange said that Argentine wheat is 49% excellent and 35% good out of a planted area of 4.3 million ha this year. Egypt were reported to have bought 240 TMT of Russian wheat in their latest tender, paying around $179/tonne FOB, or $187/tonne C&F. Coceral estimated the EU-28 soft wheat crop at 134 MMT, some 14 MMT less than their June forecast and 18 MMT below last year's record. Barley production in Europe is now seen at 59 MMT versus 61 MMT last year. That's 4 MMT below their June estimate. Dec 16 CBOT Wheat settled at $4.04 3/4, down 3/4 cent; Dec 16 KCBT Wheat settled at $4.21 1/2, up 3/4 cent; Dec 16 MGEX Wheat settled at $5.03 3/4, up 2 1/2 cents. For the week Chicago wheat was up 1 1/2 cents, Kansas was 4 1/4 cents higher and Minneapolis was up 11 cents. 22/09/16 -- EU grains closed mostly higher. The day ended with Nov 16 London wheat up GBP1.05/tonne at GBP126.55/tonne, Dec 16 Paris wheat was up EUR0.50/tonne at EUR162.00/tonne, Nov 16 corn was unchanged at EUR162.00/tonne and Nov 16 Paris rapeseed was up EUR3.75/tonne to EUR379.75/tonne matching the best close on a front month since Jun 13. 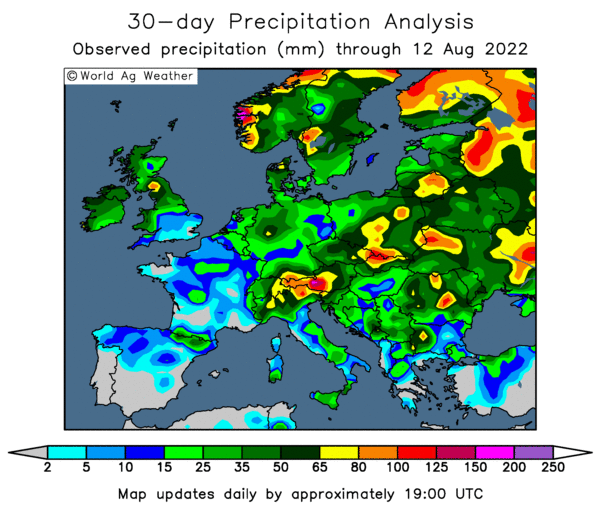 Heavy rain in the past week, following almost three months of dryness, will allow planting of winter rapeseed to begin in France. Even so, hopes of increasing sowings from last year's 1.5 million ha may now be dashed, according to media reports. Rain has also arrived in Ukraine to aid winter grain plantings there. More rain is in the forecast in the week ahead. "Yesterday, rains hit the north half of the country, even if they were light they are offering some relief to a situation becoming critical," said Agritel. 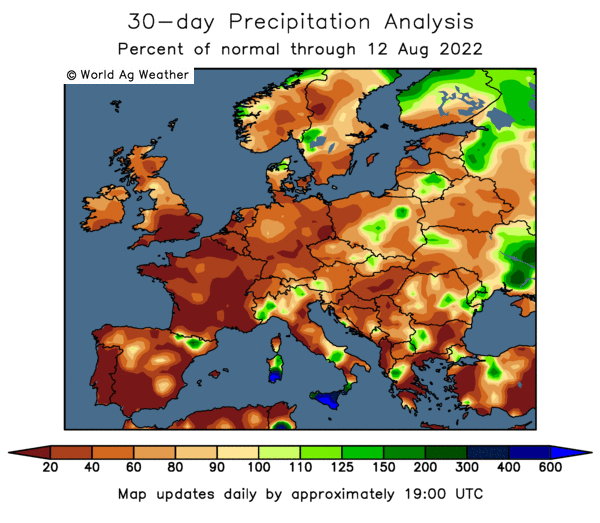 Back in France, the late summer drought appears to have harmed corn production, with early harvested yields said to be disappointing. Bulgarian wheat has arrived in Dunkirk this week to feed the French starch producing industry. FranceAgriMer has French wheat imports at 700 TMT this season, although private estimates are 1 MMT or more (433 TMT in 2015/16). Egypt's GASC are back in the market for wheat. "Doubts over Egypt’s ability to meet requirements for its bread subsidy scheme is potentially behind the change in ergot tolerance levels," said the HGCA. "Each year Egypt’s import requirements are about 7% of total global imports," they added. Their absence from the market therefore upsets the global balance sheet. Four sellers emerged with offers prepared to accept Egypt's terms, although it's unclear yet if any were successful. Ukraine said that it had agreed "informal" limits on grain exports with shippers. These have been set at 16.5 MMT for wheat and 5.6 MMT for barley. Morocco said that it had bought 310,000 MT of EU soft wheat under a preferential tariff agreement. 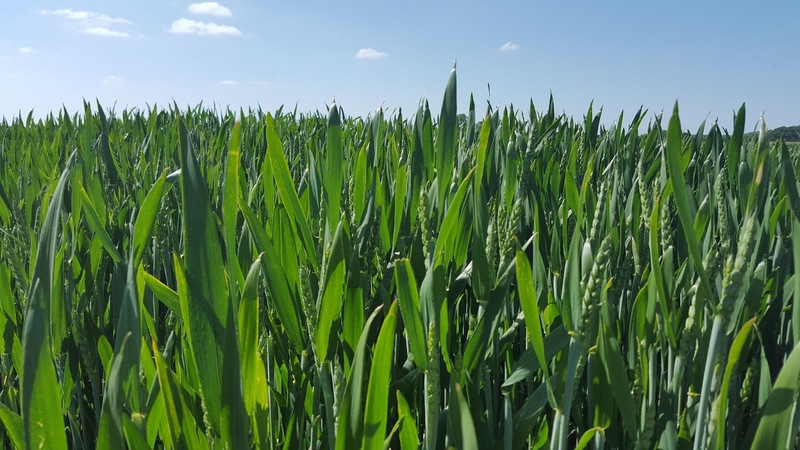 Brussels confirmed that they'd released 452,000 MT worth of soft wheat export licences, taking the volume granted so far this season to almost 25% higher than a year ago. France is unusually only third behind Romania and Germany in the table of countries granted the most exports. 21/09/16 -- Soycomplex: Beans closed lower despite the USDA announcing export sales of 364,000 MT of US beans for 2016/17 to a combination of China, Taiwan and Unknown under the daily reporting system. 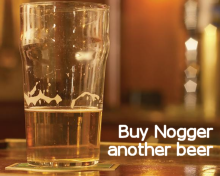 Those sales won’t show up until next weeks Export Sales report. Trade estimates for tomorrow's sales are around 1 MMT for beans. Reports of much better than expected yields coming in from early harvesting US soybean growers overshadowed that. The market is now thinking that the USDA's record 50.6 bu/acre yield projection might actually be too low. Some of today's losses may have been linked to unwinding of long beans/short corn/wheat spreads. Nov 16 Soybeans closed at $9.75 1/2, down 14 1/4 cents; Jan 17 Soybeans closed at $9.81, down 13 3/4 cents; Oct 16 Soybean Meal closed at $308.70, down $4.40; Oct 16 Soybean Oil closed at 33.40, down 43 points. Corn: The market closed with just nominal losses. Some of the unwinding of spreads may have helped corn today. Weekly US ethanol production was placed at 981,000 barrels/day last week, down from 1,004,000 bpd the previous week. Lanworth estimated US 2016 corn yields at 168.5 bu/acre, well below the USDA's 174.4 bu/acre figure. Corn planting in Brazil's is making rapid progress with Parana state now 19% done versus only 4% complete a week ago. Hungary is on the way to harvesting a record 8 MMT of corn, according to a report on Reuters. Russia's IKAR raised their estimate for this year's corn harvest there from 14.0 MMT to 14.5 MMT (record), based on better than expected early yields. Harvesting of that crop is 17.5% done so far at 2.7 MMT, with yields averaging 5.27 MT/ha versus 5.06 MT/ha a year ago. Trade ideas for tomorrow's weekly export sales report on corn are 750 TMT to 1.1 MMT. Dec 16 Corn closed at $3.40, down 1/2 cent; Mar 17 Corn closed at $3.50, down 3/4 cent. Wheat: The wheat market closed a touch higher. The USDA reported the sale of 145,000 MT of hard red winter wheat for delivery to Morocco during the 2016/17 marketing year under the daily reporting system. Reuters report that in fact they purchased 235,000 MT under a special quota deal between the two countries. Egypt rescinded their zero tolerance to ergot stance and immediately tendered for wheat for Oct 21-31 shipment under their old terms of 0.05% tolerance. The results are expected tomorrow. It will be interesting to see how may offers get put up. In Russia, wheat harvesting is 91.2% complete at 72.7 MMT. Barley adds a further 18.4 MMT (93.4%) to the mix. "The 5 day forecast has light rains for the southern plains through Saturday with a moderate to heavy system on Sunday. The 6-10 forecast continues the wet pattern for the Southern Plains during planting season," said FCStone. Trade ideas for tomorrow's weekly export sales report are modest at 350-550,000 MT. Dec 16 CBOT Wheat closed at $4.07 3/4, up 1 3/4 cents; Dec 16 KCBT Wheat closed at $4.22 1/4, up 3 3/4 cents; Dec 16 MGEX Wheat closed at $4.94 3/4, up 3 1/2 cents. 21/09/16 -- EU grains closed mostly lower in light consolidation from yesterday's gains. Fresh news was relatively scarce. At the close Nov 16 London wheat was down GBP0.50/tonne at GBP125.50/tonne, Dec 16 Paris wheat was EUR0.50/tonne higher to EUR161.50/tonne, Nov 16 Paris corn was up EUR0.25/tonne at EUR162.00/tonne, Nov 16 Paris rapeseed was EUR2.25/tonne lower at EUR376.00/tonne. The pound regained some lost ground against the US dollar after the Fed left US interest rates on hold and suggested that any rate rises would only be gradual. London wheat's gains yesterday were linked to sterling weakness versus the US currency. Russia's IKAR raised their estimate for this year's corn harvest there from 14.0 MMT to 14.5 MMT (record), based on better than expected early yields. Harvesting of that crop is 17.5% done so far at 2.7 MMT, with yields averaging 5.27 MT/ha versus 5.06 MT/ha a year ago. Overall the Russian grain harvest now stands at 107.0 MMT off 85.4% of the planted area. Wheat harvesting is 91.2% complete at 72.7 MMT. Barley adds a further 18.4 MMT (93.4%) to the mix. Russian plantings for the 2017 harvest are now reported at 58.4% complete on 10.1 million ha. 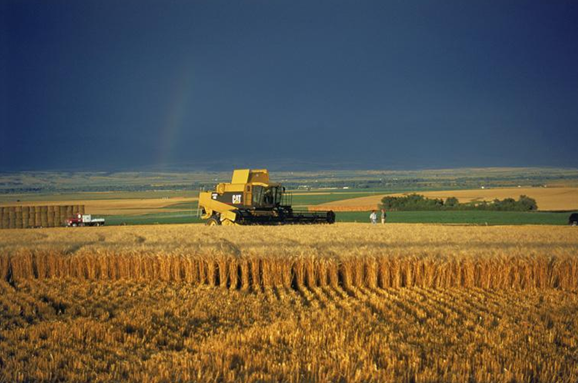 Kazakhstan's harvest is 88.6% done at 16.97 MMT. Hungary is now gathering what they are forecasting to be a record 8 MMT corn crop. 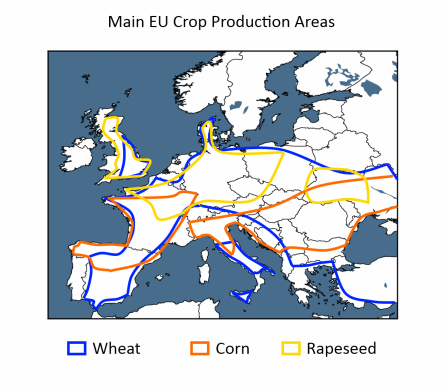 They've also harvested 1.8 MMT of rapeseed and 5.1 MMT of wheat. 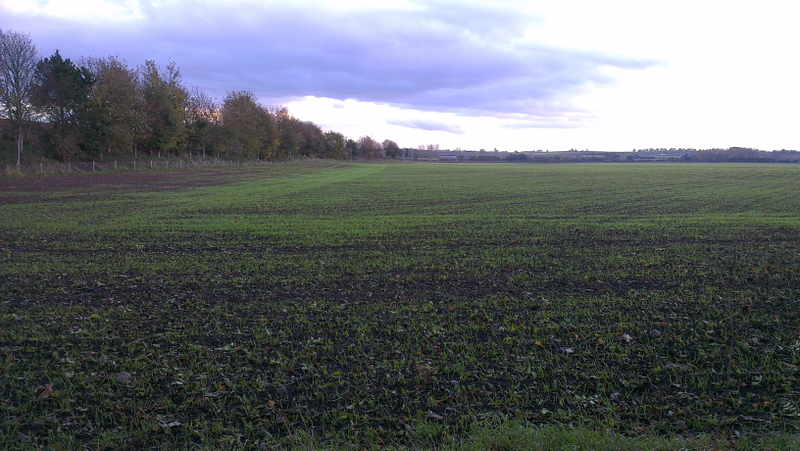 Wet weather means that only 40% of this year's wheat crop is suitable for milling. 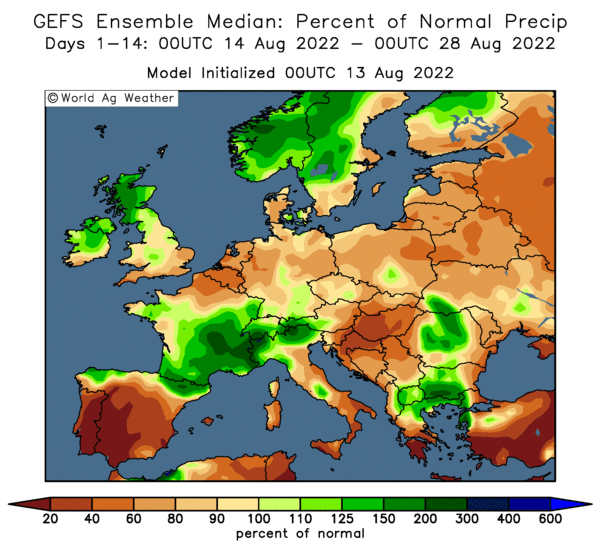 There's rain in the 6-10 day forecast for Ukraine, which will be of benefit to growers there waiting to begin planting winter wheat. Egypt's GASC overturned the recent move to buy only wheat with a zero tolerance to ergot, and immediately tendered for wheat for Oct 21-31 shipment with a 0.05% ergot tolerance. Results of that are expected tomorrow. 20/09/16 -- Soycomplex: Beans closed with decent gains. Palm oil hit one year highs in Malaysia, and soyoil responded with one month highs of it's own. "As the month of September draws to an end it is becoming apparent the veg oil s/d is tighter than was previously forecast by the trade and the USDA," said FCStone. 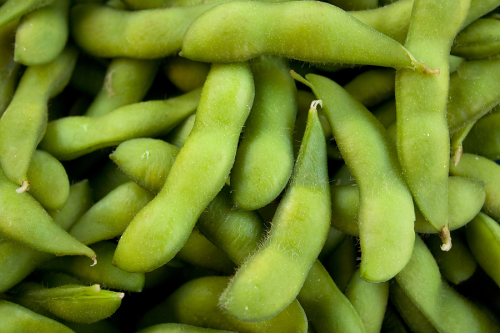 The USDA announced export sales of 110,000 MT of soybeans for delivery to China during the 2016/17 marketing year under the daily reporting system. They are expected to be an active buyer ahead of the Golden Week holiday that starts on Oct 1. Wet weather in the forecast for the US will continue to delay early harvesting attempts, keeping old crop supply and demand tight. Nov 16 Soybeans settled at $9.89 3/4, up 17 1/4 cents; Jan 17 Soybeans settled at $9.94 3/4, up 17 cents; Oct 16 Soybean Meal settled at $313.10, up $1.20; Oct 16 Soybean Oil settled at 33.83, up 100 points. Corn: Corn closed around 3 cents higher. The fledgling US harvest is running behind schedule and the current wet weather forecast offers little chance of it making up lost ground soon. That's viewed as supportive by the market, as are US exports running well ahead of year ago levels, helped by tightness in supply in South America. China only sold 1,800 MT of the 1.2 MMT of government owned corn supplies offered up at auction. Much, if not all, of these stocks are 3-5 years old hence end user reluctance with new crop availability just around the corner. Russia said that it's 2016 corn harvest was 16.5% complete at 2.5 MMT. Ukraine's new crop corn is 10% done at 2 MMT. Final production is estimated as high as 26 MMT. Ukraine's export effort will soon switch to corn. Stats Canada estimated Canadian corn production at 13 MMT, down 2.9% from last year. December CBOT corn closed above the 50 day moving average for the first time since June 21st tonight. Dec 16 Corn settled at $3.40 1/2, up 3 1/4 cents; Mar 17 Corn settled at $3.50 3/4, up 3 1/4 cents. Wheat: Wheat closed mixed. Higher trade in corn and beans provided some support. Stats Canada came out with production numbers of 31.3 MMT for all wheat and 20.5 MMT for spring wheat. That was about what the trade was expecting. Russia's wheat harvest reportedly stands at 72.4 MMT off 90.5% of the combinable area. Yields are said to be averaging 2.89 MT/ha, up 9% versus 2.65 MT/ha a year ago. The Russian barley harvest stands at 18.4 MMT off 93.1% of plan. Plantings for the 2017 harvest are already said to be 56.1% complete. US winter wheat plantings are just getting going at 16% done, according to the USDA. Low prices and a general disenchantment with the crop could see growers plant the smallest area in more than 100 years, according to some estimates. US dollar strength remains a thorn in the side of potential wheat exports. Some analysts are predicting a Fed interest rate rise tomorrow, which won't help any. Platts reported that Indian buyers have booked around 500,000 MT of Ukraine wheat "under the radar" in the past 6 weeks as availability of state-owned supplies tightens. Dec 16 CBOT Wheat settled at $4.06, up 2 cents; Dec 16 KCBT Wheat settled at $4.18 1/2, up 2 cents; Dec 16 MGEX Wheat settled at $4.91 1/4, down 1 1/4 cents. 19/09/16 -- Soycomplex: Soybeans closed higher on strong demand and fears of a late start to the 2016 harvest further tightening the old crop supply situation. Weekly export inspections of 755,120 MMT were good, albeit down 20% from last week, they were still 50% larger than the same week in 2015. Inspections to date are running 212% ahead of last year at 1.9 MMT. The USDA reported weekly crop conditions unchanged at 73% good to excellent. The 2016 harvest was said to be 4% complete as of Sunday night (versus 5% normally) and the proportion of the crop dropping leaves is 46% against 43% normally at this time). Nov 16 Soybeans settled at $9.72 1/2, up 6 1/2 cents; Jan 17 Soybeans settled at $9.77 3/4, up 6 1/2 cents; Oct 16 Soybean Meal settled at $311.90, down $1.80; Oct 16 Soybean Oil settled at 32.83, up 85 points. Corn: The corn market closed with marginal gains. Weekly export inspections of 1.285 MMT were down slightly from the previous week, but 75% larger than the same week in 2015. Export pace is so far running well ahead of last year. The USDA reported US corn crop conditions unchanged at 74% good to excellent. They said that nationally the crop is 9% harvested against 12% normally. They have 53% of the crop mature, 5 points ahead of the norm for this time. The crop is 93% dented compared to 91% typically. Ukraine said that it had exported 583 TMT of corn so far this season. Russia has exported only 94 TMT. Russia's new crop corn harvest is now said to be 14% complete at 2.1 MMT. Private exporters reported to the USDA export sales of 191,000 MT of corn for delivery to Mexico during the 2016/2017 marketing year under the daily reporting system. Dec 16 Corn settled at $3.37 1/4, up 1/4 cent; Mar 17 Corn settled at $3.47 1/2, up 1/4 cent. Wheat: The wheat market closed narrowly mixed. As expected Egypt picked up zero in their zero tolerance to ergot tender, with no offers made. Weekly export inspections came in at 562,215 MT, below both a week ago and a year ago. Russia's exports via seaports dipped off to only 229.4 TMT last week, including just 112.9 TMT of wheat. They are going to miss Egypt more than anybody as things stand. There's continued talk that despite bumper production this year (they're currently said to have harvested 72 MMT of wheat off less than 90% of the planned area) quality isn't great, which could also be having an adverse affect on exports. Another country whose exports are down in Canada. The Canadian Wheat Board put their exports so far this season (starting August) at 1.47 MMT, down 34% on the same period in 2015/16. Low prices mean than US growers will sow the smallest winter wheat acreage since 1913, according to Farm Futures Magazine. Winter wheat is currently 16% planted said the USDA. Spring wheat harvesting is 98% complete. Dec 16 CBOT Wheat settled at $4.04, up 3/4 cent; Dec 16 KCBT Wheat settled at $4.16 1/2, down 3/4 cent; Mar 17 MGEX Wheat settled at $5.02, down 3/4 cent. 19/09/16 -- EU grains closed mostly higher to start the week. The day ended with Nov 16 London wheat up GBP0.80/tonne at GBP124.40/tonne, Dec 16 Paris wheat was up EUR1.75/tonne at EUR160.75/tonne, Nov 16 corn rose EUR0.25/tonne to EUR160.75/tonne and Nov 16 Paris rapeseed was up EUR2.25/tonne to EUR374.75/tonne. Egypt's Gasc held another fruitless wheat tender, picking up no offers in an effort to buy wheat for October shipment under the new strict zero tolerance to ergot rules. APK Inform said that Russian grain exports via seaports fell to only 229.4 TMT last week, down from 429.8 TMT the previous week. Of the total shipped, 112.9 TMT was wheat, 77.5 TMT was barley and 32.5 TMT was corn. Ukraine's seport exports were also down, but still considerably higher than Russia's at 596.1 TMT (819.7 TMT the previous week), of which 480.8 TMT was wheat, 104.5 TMT was barley and 10.8 TMT was corn. Russia's season to date exports are down 2.7% year-on-year at 7.45 MMT (wheat 6.32 MMT, barley 1.0 MMT and corn 94 TMT). Ukraine's exports so far are 8.51 MMT, of which 5.1 MMT is wheat, 2.75 MMT barley and 583 TMT corn. The 2016 Russian harvest is now 83.9% done according to the Ag Ministry, standing at 105.5 MMT off 39.7 million ha. That includes 72 MMT of wheat (89.7% harvested), 18.3 MMT of barley (92.9% done) and 2.1 MMT of corn (14.1% complete). Russian plantings for the 2017 harvest are said to be 54.3% done on an area of 9.4 million ha (versus 9.0 million a year ago). Oil World estimated Australia's 2016 rapeseed crop at 3.6 MMT (up sharply from 2.94 MMT a year ago, despite only a 4% rise in planted area).